Tonight's was the rare presidential debate where the pundit commentary was more interesting than the debate itself. Specifically, liberal commentary. On MSNBC, they were ready to tar and feather the president for not mentioning Bain, not mentioning the 47 percent, not doing much of anything except looking bored and playing defense. "Where was Obama tonight?" 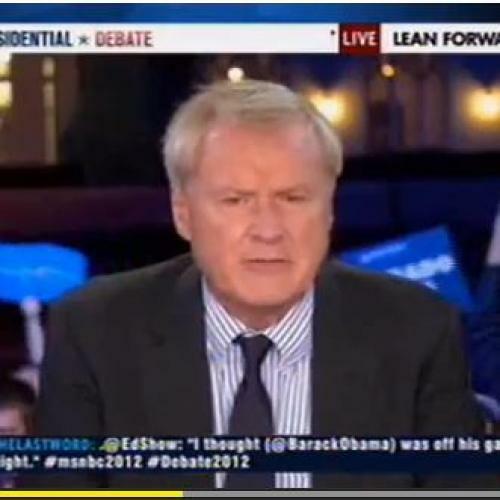 Chris Matthews wailed. "Why didn't the president probe him aggressively on all the recent points of information?" It was the right question, but the pundits' outrage was tinged with hubris. That was most evident when Matthews, astonishingly, recommended that the president watch MSNBC to learn how to defend liberal positions. At this point cable news exists almost entirely to let journalists argue with people: other journalists, Washington-based partisans, occasionally the odd public official. It's easy to see how you might come to wonder why the serious business of political argument should be entrusted to those amateurs who call themselves politicians. Don't get me wrong. Matthews and Co. were basically right that Obama's performance was very weak. But their dudgeon was excessive, and revealing of how TV news today is all about aggression, not inquiry.